We've been living on soup since Sunday. No, not turkey leftovers soup. A cure-for-all-ills soup. You see, Steve- that ordinarily upbeat and tenacious husband of mine- has been feeling a tad under the weather these past few days. In truth, more than a tad. He's caught a nasty cold. The kind of cold where you ache all over and do nothing but lay in bed watching a marathon of Lost on your laptop because to even zombie-walk to the sofa loveseat too-small-to-lay-on requires functional navigation skills and balance beyond your sinus-throbbing capacity. Lucky for me, I've not succumbed to the zombie-walk inducing bug. Yet. And just in case, I've been cranking out soups. An ounce of prevention and all that. And medicine. Because when I'm not in top gluten-free goddess form conserving energy means dragging out the Crock Pot for some easy slow-cooked comfort. This is a simple healing soup with the goodness of cabbage (so beneficial to a celiac's tummy) and lots of garlic (an all-purpose fighter of evil and undead mayhem not to mention, a natural immune booster and cold-fighter). Green chiles. But is my chicken soup powerful enough to stave off zombies ? Ah, that is the question. And here is another. I ask you (in honor of my zombie literate son who knows from zombies). Please. Do zombies run? Discuss. This isn't your old school, blah albeit salt laden chicken soup. Your Mama might not approve of the liberties I've taken crankin' up the standard more than a simple notch. But. Tradition is one thing. Great taste is another. I say, be flexible. Sea salt and freshly ground pepper, to taste- start with less! Drizzle some extra virgin olive oil into the bottom of a Crock Pot or slow cooker . Lay the chicken breasts in the bottom; top with half the chopped garlic. Season with sea salt and pepper. In a large bowl, combine the shredded cabbage, bell pepper, yellow and zucchini squashes, potatoes, and green chiles; and toss them with a drizzle of extra virgin olive oil. Season with sea salt, ground pepper, herbs and a shake or two of hot red pepper flakes. Toss to coat. Pour the veggies into the crock in an even layer. Pour on the diced tomatoes. Add the chicken broth and a dash of balsamic vinegar, to taste. The liquid should just about cover the veggies. If you like more of a brothy soup than a stew, add more broth. Cover and cook on high for 5 to 6 hours, until the chicken is tender and easily breaks apart into pieces with a large spoon (my chicken was very cold when it went into the pot, so adjust your cook time accordingly, if you need to). Taste test for seasoning adjustments. I added a pinch of brown sugar to mine to balance the tomato-garlic and spice. Stir in any seasoning adjustments and serve. 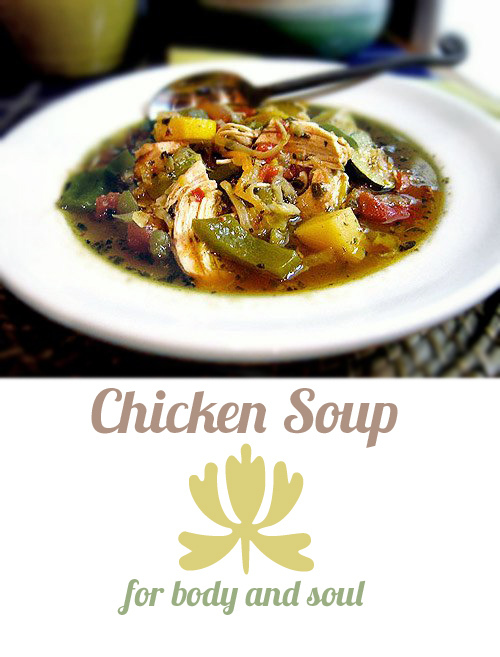 Makes four hearty servings to soothe you- body and soul. This recipe is gluten-free, soy-free, dairy-free, corn-free. I made this recipe like a peasant-style stew, starting with a layer of split chicken breasts on the bottom of the crock pot- drizzled with extra virgin olive oil, of course. Then I added eight cloves of fresh chopped garlic, lots of cut-up veggies, herbs, a can of fire roasted diced tomatoes, green chiles, and just enough organic chicken broth to cover the veggies. Good stuff.